It’s a lovely, heavy-weight striped denim. 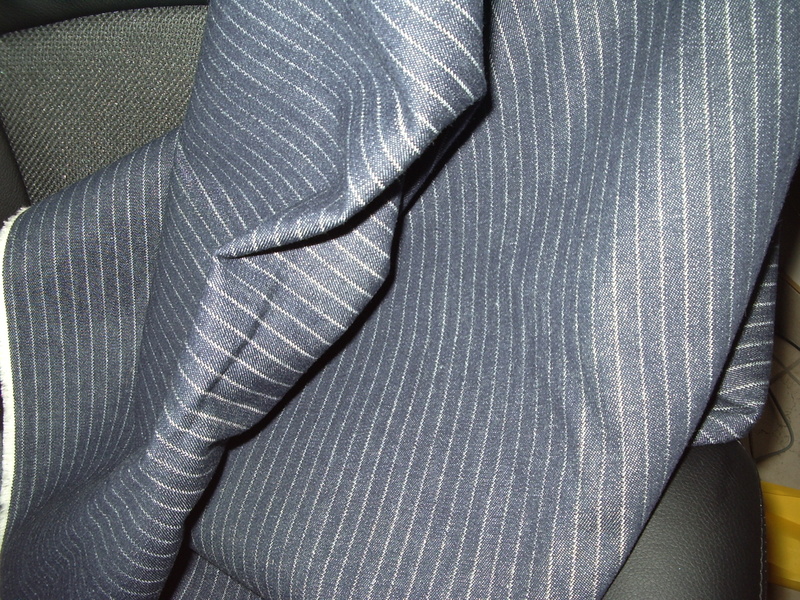 The colour in the photo is crappy—it’s a fairly standard dark-wash indigo between the lighter stripes. I was not bad—a co-worker gave it to me. Cool! It’s not stretch, so it can’t become my next pair of Jalies (too bad, really). I’ve been dreaming of jean-jackets, but aside from lacking a pattern, it’s a little too gorgeous for a casual, slouchy kid jacket (and I already have a perfectly good jean-jacket for myself). If you put a zip in the centre-back (instead of using the button-opening at the front) then you could “fake” the buttons (ie no buttonholes to make) and put in some useful pockets instead! Opps 😦 😦 😦 – re: spelling “S” & “W” are next to each other on the keyboard – big apologies – it should say off-white…. can you edit it please? Yeah, that one is another I have downloaded (you have good taste! 😉 and I love that shortened version)… I love free patterns, and the BurdaStyle ones are some of the best I’ve come across :). I also have a surprisingly classic 80s women’s suit-jacket pattern that I keep meaning to give a go. However somewhere along the line it lost its envelope and instructions! So I will probably choose between those two. Or, y’know, wimp out and go with the skirt :). I want to believe that there’s enough fabric for both but I’m probably deluding myself. Sewing the Kasia would definitely be easier, but I’d probably get a lot more use out of a blazer.